Life with Aspergers: Book Review: Sensory Parenting: The Elementary Years by Britt Collins MS, OTR and Jackie Linder Olson. 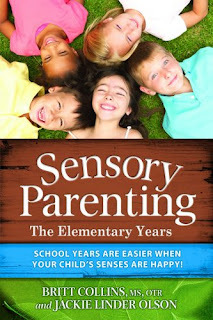 Book Review: Sensory Parenting: The Elementary Years by Britt Collins MS, OTR and Jackie Linder Olson. School Years Are Easier when Your Child's Senses Are Happy! by Britt Collins MS, OTR and Jackie Linder Olson. Sensory Parenting: The Elementary Years is a sequel of sorts to Sensory Parenting: Newborns to Toddlers. To me it feels like a much more accomplished book - perhaps though, it's simply the fact that this one is far more relevant to my current situation. Like its predecessor, the book focuses on finding ways around your child's sensitivities and it's designed for parents of children with a range of complications, including but not limited to, Sensory Processing Disorder (SPD), the Autism spectrum in general and Attention-Deficit Hyperactive Disorder (ADHD). Like the first book, this is a collaboration between a mother (Jackie) and a paediatric occupational therapist (Britt). Somehow, this time around, their voices are far more harmonious and the switching between Britt and Jackie's point of view is far less jarring. Both authors have a lot of good material and the book is a breeze to read. The introductory chapters cover the senses, going well beyond the five established ones; sight, smell, taste, touch and hearing to include vestibular (balance), proprioception (body awareness) and interoception (internals). The book also lists developmental milestones and discusses ways that you can extend your child's social repertoire. The book also includes insightful and relevant paragraphs from other experts in the field including interviews with various specialist OTs to discuss the range and use of their therapies. There are also "OT tips" and "mom tips" scattered throughout the book. The middle section of the book delves into specific sensory situations at home, at school, on holidays and in the world at large, with a chapter on each major area. Everything is very well labelled and helpful headers simply leap out at you. The last few chapters cover sensory games, activities and therapies that you can use to desensitize and habituate your child. The book closes with useful appendices which contain relevant material from the first book on the use of pets as support animals and on dealing with food sensitivity in your child. All in all this is an excellent book which I'd recommend to anyone with sensory children in elementary school (primary school here in Australia). Of course, if you're an OT, then a copy is pretty much mandatory reading. Sensory Parenting: The Elementary Years is available from; Amazon, where it's available as a paperback or a Kindle book, Goodreads and Future Horizons. Honesty disclaimer: I was provided with a copy of this book free of charge for review purposes. Yes, I have this book in my arsenal. However, please note that OT is a very broad field. Some might be well versed with sensory than others because of the area(s) they specialize in.